Brown Butter Vanilla Bean Bundt Cake is a lightly sweet cake with a velvety moist crumb that explodes with vanilla flavor in your mouth. It’s easy and basic, which makes it a perfect go to cake for almost anything from strawberry shortcake to birthday cake. I was in the mood to bake a cake the other night. I didn’t really have time for a full blown layer cake with all kinds of gooey yumminess… I wasn’t even in the mood for that. I wanted something simple and easy, and something I could use about a half cup of leftover ganache on. I paged through my cookbooks and I came upon the Brown Butter and Vanilla Bean Weekend Cake in Baking Chez Moi by Dorie Greenspan. Reading through the ingredients I knew this was the one. 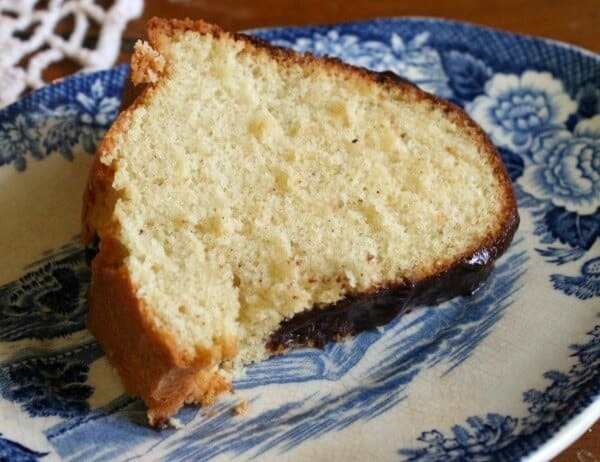 Moist, with a dense crumb flecked with vanilla beans the texture is similar to a pound cake. This cake is seriously good, not cloyingly sweet like a yellow cake but delicately sweet in a way that encourages you to take another bite. And another. And… well, you know. Another. This is the first time that I made a cake by weighing the ingredients rather than measuring. I think it made a difference in the end result. I’ve been wanted to weigh ingredients for awhile it just seemed like it would be time consuming. I don’t really like to change how I do things, you know? I was surprised to find that it was actually easier and I was more confident because I knew that there was the exact same amount of flour and called for in the recipe. I have a small kitchen scale and it was super easy. 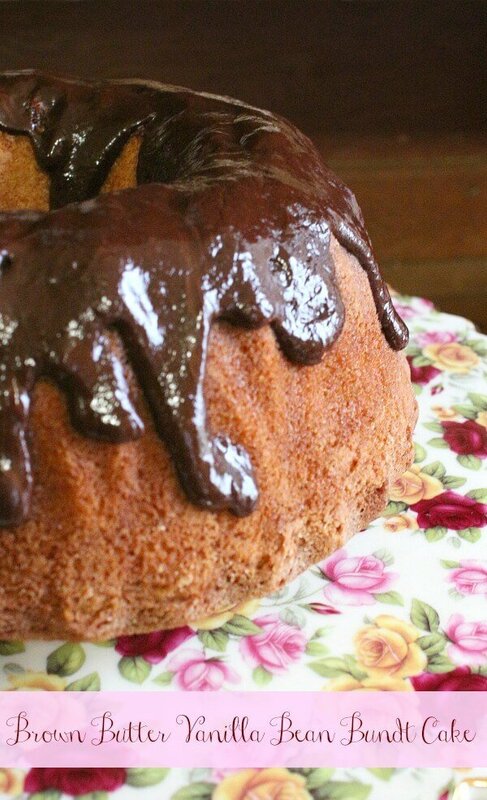 I didn’t make a lot of changes to this vanilla bean bundt cake, to be perfectly honest. There is a point where you have to realize that screwing with perfection is just dumb. I had one of those moments while making this. Think of this recipe as the Little Black Dress of the cake world. I added the ganache but I can tell you this would be great with fresh fruit compote, ice cream, custard sauce… whatever. The following are affiliate links. If you click through and buy something I’ll get a small commission which helps handle the expenses of keeping the blog up and running. SO.. thank you! Give this a try, I am pretty sure it’s going to be a family favorite. Oh, and the cake plate? You can find it at Victorian Trading Company – isn’t it amazing? In a heavy saucepan melt the butter until it turns the color of honey. Be careful not to let it burn. Split the vanilla beans in half and scrape the seeds in to the sugar. Smush the vanilla beans into the sugar until the sugar is moist and smells like vanilla. Whisk the flour, salt, and baking powder together in another bowl. With an electric mixer beat the eggs into the sugar until light - about a minute. Beat in the vanilla extract then the cream. Stir in the dry ingredients until the batter is smooth. Fold in the butter in 2 different batches. Bake for 55 minutes or until a cake tester comes out clean. Cool in the pan for five minutes and then turn out to cool all the way. Top with ganache or your favorite toppings. I will take this over the layer cake any day of the week! Loving the vanilla beans in this!!! Looks so so good Marye! I love browned butter and recently used it in my carrot cake recipe. I really need to buy a bundt cake pan! I know, I bake all the time and do not own one! It’s so good with fruit!